Although Ohio is known for its crazy weather pattern, I can say with a degree of certainty that summer will arrive. When it does, the City is ready, with prepared plans for a full calendar of fun, entertaining events showcasing our award-winning parks and local treasures. I invite you to explore Grove City this summer and discover something or someplace new with your family and friends. Hop on your bicycles and hit the trails. 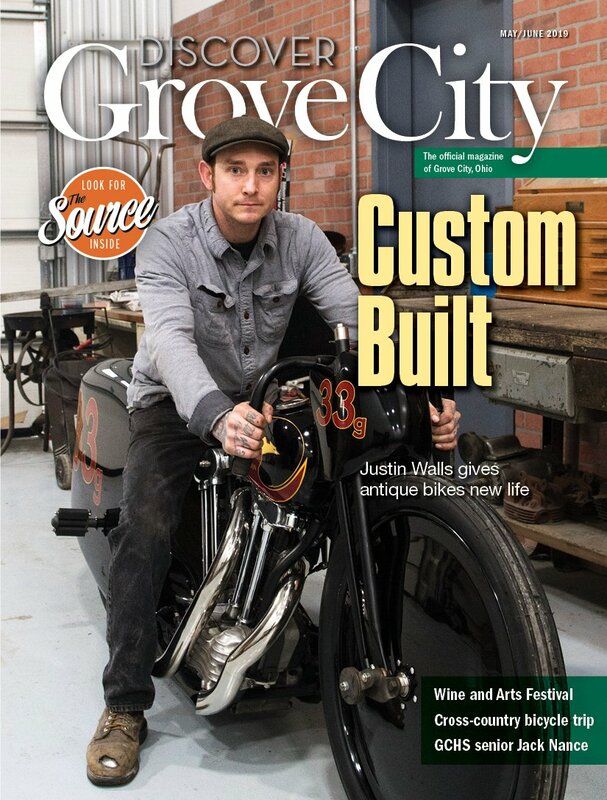 Over 26 miles of paved pathways stretch to every corner of Grove City and connect historic Town Center with all neighborhoods and parks from Central Crossing High School to Fryer Park and Scioto Grove Metro Park. Have fun and set a family challenge to enjoy a picnic lunch at each of the City and neighborhood parks before the summer ends, there are 21 of them, so you had better get started. Begin your park tour with the Gardens at Gantz where you will find superbly manicured gardens, a meditative labyrinth, handicap-accessible trails and more – something for the entire family. For more family fun, take the crew to Fryer Park Thursday evenings during June and July to enjoy a free, family-friendly movie under the stars or take in a baseball game under the lights at Windsor Park. Windsor Park flourishes with activity in the summer, beginning May 3 with the Friday Night Grand Slam and Grove City Wall of Fame induction ceremony, celebrating the start of the Little League® and Buddy Ball baseball seasons. From that moment on, the diamonds are filled with the joy of baseball for players of all ages and abilities. Opportunities abound for catching up with old friends or making new ones at any of our wonderful summer events. Friday evening Summer Sizzle concerts at George Edge Music Park on Broadway kick off May 24 with a performance by the Grove City Community Winds, conducted by James Swearingen. New this year during the concert is our very first Touch-a-Truck event, hosted by the Service Department. June 14-16 is a busy weekend in Town Center as the Heart of Grove City’s Wine and Arts Festival coincides with the Ohio Flags of Honor annual display and patriotic concert. July is also eventful beginning with our Independence Day Celebration and impressive firework display. The last weekend of the month brings droves of GCHS alumni to town as the Annual Homecoming Celebration is held in Town Center, centered on the Annual Grove City High School Alumni Softball Tournament — touted as the world’s largest alumni softball tournament. August keeps things going with National Night Out to kick off the month. Residents can take in all things green at the EcoFest, Aug. 10, and a few blocks over, the Heart of Grove City Bourbon Tasting closes out the day in Town Center. Remember to support your hometown and take your summer shopping to a new level by patronizing local vendors found throughout all of Grove City. Spice up your spree and ride your bike to Town Center then stroll the walkways during the Saturday morning Farmers’ Markets beginning May 18. Explore the unique wares of area merchants or enjoy an al fresco meal, tasty treat or soothing drink at one of Town Center’s dining establishments. The coming warm weather beckons us outdoors to explore all our community has to offer. Be safe and enjoy the many wonderful ways to spend the summer. More than 70 years ago, a local farmer and his wife launched a poultry business, eventually growing to become the largest turkey farm in the state for nearly 20 years. In 1948, George and Martha Milligan began their business with approximately 2,500 turkeys on their Hoover Road farm. Two years into their venture, the extreme Ohio weather threatened business. Nov. 1, 1950, recorded a record high temperature of 80 degrees, only to be followed three weeks later by freezing temperatures and blizzard conditions. The Great Appalachian Storm of 1950 descended quickly into the area and dropped more than 15 inches of snow in two days with winds creating drifts up to three feet or more. Mr. Milligan and several friends struggled throughout the day to herd the fowl to shelter. In all, only 150 young turkeys were lost and the business did not suffer. Finding immediate success, the following years led to the Milligans quickly amassing an annual brooding of about 15,000 birds, adding a modest processing plant for dressing services and increasing the size of the farm to 170 acres by 1955. The Milligans were generous with their success and annually donated 20 to 30 turkeys to families in need. They also welcomed scouts, 4-H clubs and future farmers, providing tours and educational lectures. One of the barns on the property became a hangout for the Milligans’ two sons and many other area youths when one end was cleared and a basketball court was installed, followed by spectator stands and a “press balcony.” In the early 1970s, the court was home to the annual Cow Palace St. Valentine’s Day Basketball Classic for Grove City High School alumni, hosted by the Milligan family. In 1967, the Milligans closed the turkey farm and retired. The land is now home to Bethel Lutheran Church, Grove City High School and the appropriately named Martha’s Wood neighborhood of homes. The Milligan farm remains a cherished memory to many in the community. They say a rising tide lifts all boats, but our last economic recession left many in our community behind. Sometimes residents can use a little help. Grove City is home to three excellent assistance agencies: Mid-Ohio Foodbank, Grove City Food Pantry and MASH Pantry and Resource Center. Mid-Ohio Foodbank, 3960 Brookham Drive, distributes food across 20 counties to 680 agencies. Sourced through the U.S. Department of Agriculture, that’s approximately 66 million pounds of food or 140,000 meals to hungry families each day. With the help of regional grocery chains, food producers and local farmers, fresh produce accounts for approximately half of the total food provided. The Grove City Food Pantry, 2710 Columbus Street, is one of the agencies supported by Mid-Ohio Foodbank and generous donations of area residents. The pantry first served the community from a small room in the basement of Grove City United Methodist Church and moved to its current location on Columbus Street as the community needs increased. Four directors now coordinate more than 60 volunteers, serving an average of 230 area families a month – nearly 12,200 individuals each year. Offering multiple resources of support for veterans, military families and survivors, the MASH Pantry and Resource Center, operating out of Victorious Living Church, 2735 Columbus Street, offers monthly produce markets, personal hygiene items and clothing when donations permit. The service is run entirely through volunteer efforts and community donations, with no government funding. Open two days a month, the Resource Center also provides PEER support meetings for veterans and first responders experiencing PTSD, depression, anxiety, etc. If you or someone you know could benefit from these services, check out the following information. “Tasteful” growth has occurred in historic Town Center over the last several years including expanded dining options for residents and visitors – four opened within the last year. The newer dining establishments in Town Center include Transcend Coffee + Roastery, Garden Bar Café, Zassy’s Tap Room & Home Décor and Local Cantina. Each of these brings a wide variety of affordable dining options and its own unique vibe. Local Cantina is the most recent eatery welcomed to Town Center. Open since December, the restaurant greets a steady flow of patrons enjoying its unique atmosphere and delicious menu items showcasing a twist on the classic Tex-Mex flair. Taking great care to maintain the integrity of the traditional building it occupies, Local Cantina is embracing the architecture while blending modern amenities. The large windows facing Broadway and Mill Street offer a fun view of Grove City and overlook the future outdoor dining area, slated to open as warmer days approach. All the new dining options in Town Center are valued additions to the neighbors that are treasured mainstays of our hometown. Though many restaurants have come and gone, passed through multiple owners’ hands or changed names, none have been in business at the same location longer than Zamarelli’s Pizza Palace. Whether it’s Friday nights after the game or a Little League baseball party, locals loyal to their favorite hand-tossed pie from “Zam’s” and have been picking up dinner from the same small, white concrete block building on Front Street in Town Center since 1963. From the entertaining atmosphere of Plank’s on Broadway to the tasty treats at Capital City Cakes, Town Center is a charming, walkable area with plenty of affordable dining options, sure to satisfy even the most sophisticated foodie. Whether you’re seeking a traditional meal from Lilly’s Kitchen Table or meeting up with friends at Grove City Brewing Co. or Plum Run Winery, the historic streets of Grove City’s Town Center have exactly what you’re craving.